Tokyo: Japan issued evacuation advisories for more than a million people and cancelled hundreds of flights as Typhoon Jebi sliced across the west on Tuesday, killing at least six people. 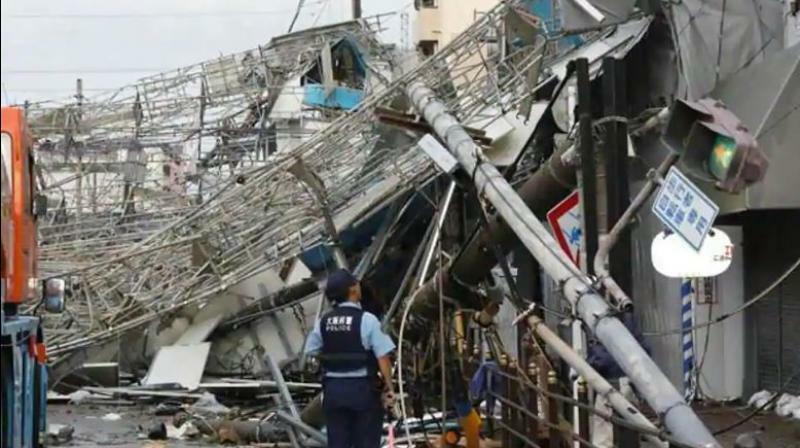 Jebi -- whose name means “swallow” in Korean -- was briefly a super typhoon and is the latest storm to hit Japan this summer following rains, landslides, floods and record-breaking heat that killed hundreds of people. The centre of Jebi was at sea north of Wajima in Ishikawa Prefecture, central Japan, at 7 p.m. (1000 GMT) and heading north-northeast, NHK reported. Some 1.45 million households were without power in Osaka and its surrounding areas at 3 pm (0600 GMT) Toyota Motor Corp said it was cancelling the night shift at 14 plants.